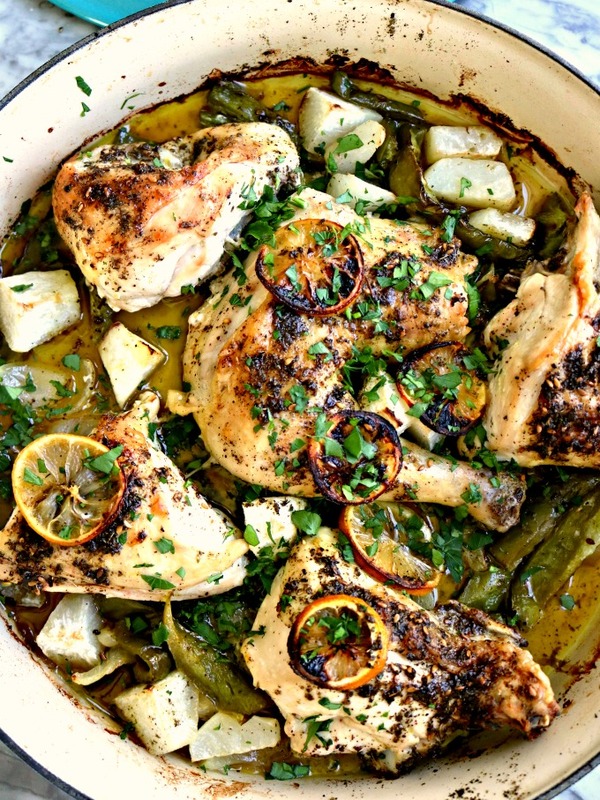 Za'atar Chicken with peppers, onions, lemon and olive oil. Keto Friendly, Paleo, Whole 30 friendly. Salt chicken pieces one day in advance if you have the time. Take chicken out one to two hours in advance of baking. I tend to leave the salt on the chicken. If you didn't do this step, salt chicken. Trim bell pepper and seed. Cut bell pepper and onion into strips and slices. Place on bottom of pan. Drizzle olive oil over the pieces. Place the chicken on top of the vegetables, skin side up. Drizzle olive oil over the chicken pieces. Sprinkle za'atar over chicken generously. Add in turnips or potatoes in between chicken pieces, making sure they also are covered with olive oil, salt and pepper. Bake at 400 degrees for 45 minutes or until chicken has internal temperature of 165 degrees F.